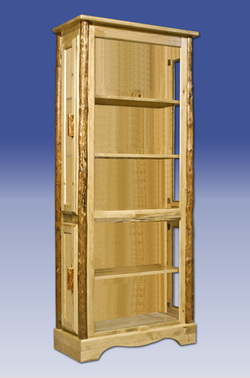 These wooden lodgepole pine gun cabinets are very well made and hold up to 8 guns or rifles. The doors are locking so you can lock them up and the two drawers are very heavy duty to hold all your ammo, etc. Door hides storage are as well. Glass windows and rustic log trim completes this wood gun display and will be a nice storage for your guns for many years! 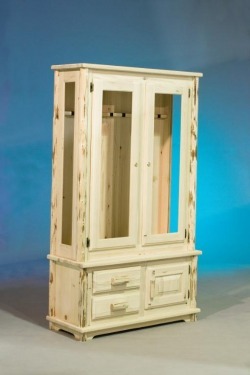 ﻿ The trim and handles of this solid pine gun cabinet are strip peeled logs and the rest is solid lodgepole pine wood. Amish hand made in Montana, USA, it will last for many generations! No cheap particle board is ever used in any of our furniture. 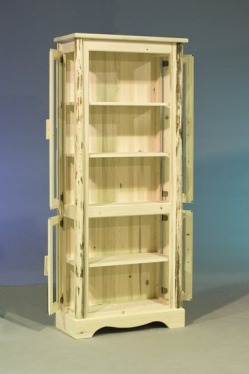 The gun cabinet holds eight rifles or shotguns protected by lock and key. Underneath that, are two small drawers and a third door that easily holds your ammo and other sporting essentials. Ships in one piece and we offer FREE SHIPPING on all of our furniture. Visit our secure website here => www.AmishLogFurniture.com to see more details and to purchase any of our log furniture. 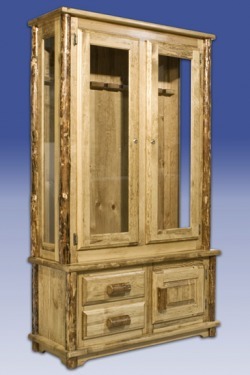 Showcase your collectibles and family heirlooms in this lodgepole rustic pine curio cabinet. The Rustic Curio will add a decorative flair to any room or office. Features lodgepole pine construction with glass front and sides, and two small glass doors on each side. Dimensions on the pine curio are: 30W 14D 76H. Shipping is FREE - shop from the comfort of your home, avoiding crowded shopping centers and have your furniture delivered to your doorstep for free!